If you love tea, especially green tea, Tokyo would seem like paradise. In a dense metropolis with room for both tradition and quirky invention, tea is ageless. Extracting complex flavour and made with precision, or paired with simple fare, tea appreciation is well entrenched within all strata of society. During our trip, we visited a few places offering novel and interesting experiences, thus deepening our knowledge about the subtleties of Japanese tea. Sakurai Japanese Tea Experience is a boutique tea salon distinctive for its sleek minimalist fitout featuring expressive wooden panelling, copper fixtures, soft mood lighting and a curated range of fine tea wares on display. Be sure to partake of the popular appointment-only tea service at the salon counter, seating a mere eight people in an intimate bar space overlooking downtown Omotesando. On offer is a menu with a multitude of seasonal Japanese teas and tea blends including house roasted hojicha, tea cocktails, tea and wagashi, traditional sweets, through to kakigori, shaved ice. During our visit we indulged in a selection of Finest Grade Gyokuro with matching sweets of our choice. Our host, donning a crisp white laboratory coat, conducted the ceremony in an skilful and unhurried way. The arrangement of vessels and the preparation of four infusions of tea was performed with great attention to detail. At the point that the tea was almost exhausted of flavour, our host invited us to cover the leaves with a delicate ponzu dressing and enjoy the tender leaf salad. Overall this is a wonderful venue to deepen your knowledge and appreciation of fine Japanese tea, soak up a tranquil ambiance amidst downtown Tokyo, and perhaps walk away with teaware that you wondered how you ever lived without. This retail space is a dedicated purveyor of high quality, Japanese single-origin sencha and complementary products. 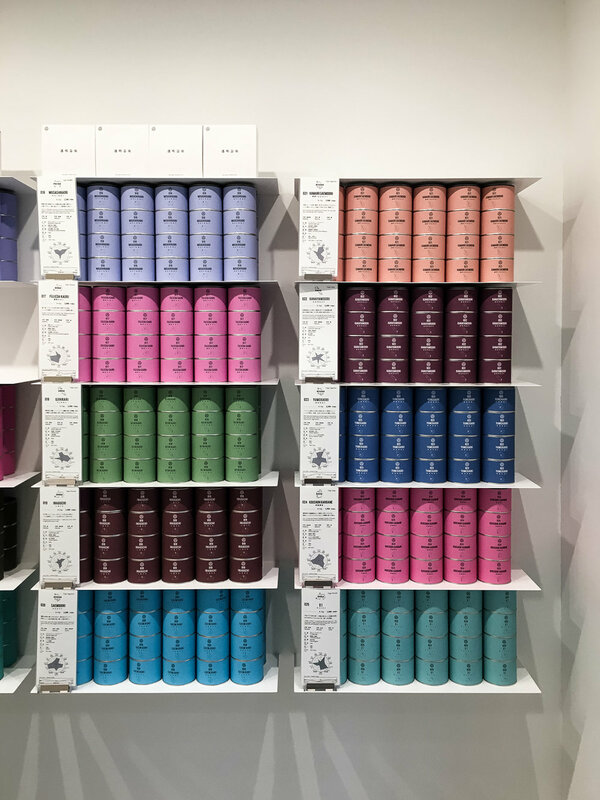 Impeccably stacked, colour coordinated shelves of cylindrical packaging are a real feast for the eyes. What sets this vendor apart is the uniformity of packaging design. Rather than buying a tea based on its price point or the flashiness of its label, each tea is categorised by its flavour profile instead. Aiding your purchasing decision is a neatly presented chart, which plots the concentration of a particular tasting attribute, whether it is sweetness, astringency or umami. You can also learn more about the terroir of the tea, including the region that it was grown in and the cultivar used. A standout product is the patented transparent teapot dreamt up by parent company Lucy Alter Design, which is a durable, attractive and modern rendition of the traditional kyusu. The retail staff will readily demonstrate how easy it is to use by serving up two short infusions at increasingly higher temperatures, followed by a final flash infusion with a dash of mochi to balance out the astringency. During warmer weather, the vessel is perfectly suited to holding a couple of ice cubes that slowly drop over your tea leaves. You needn't worry that you will make the wrong choice, as there are free tasting samples available in both hot and cold brew format, as well as regularly scheduled tea appreciation workshops. Don't forget to check out the tea snacks and top-up pouches of mochi to take home on your visit! Seen from the outside, Hachiya is an unassuming small shop front along one of Shibuya's quieter backstreets. Upon entering you realise that this quaint establishment is a true tea oasis, perfect for a quick takeaway cup matched with a sweet or savoury treat. 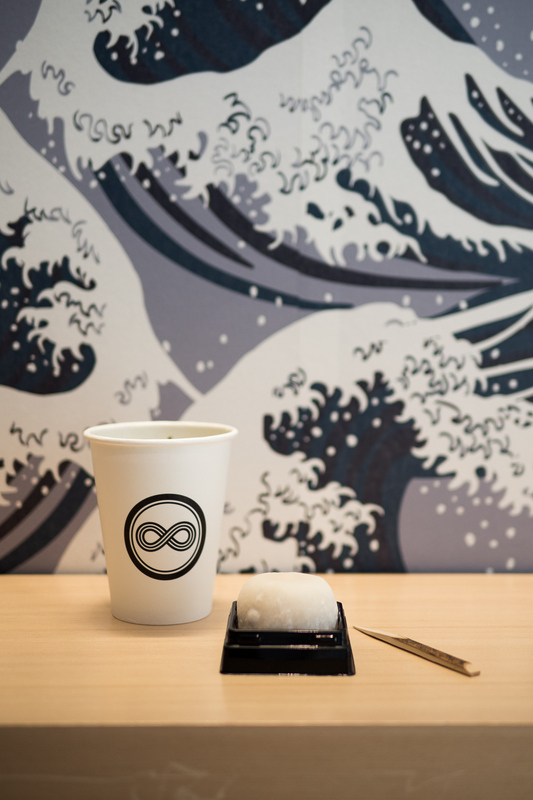 The space is unpretentious and comfortable, giving you the chance to sit back and admire the wave-art wallpaper, browse the neat shelves of earthenware and look on as your beverage is prepared before you. 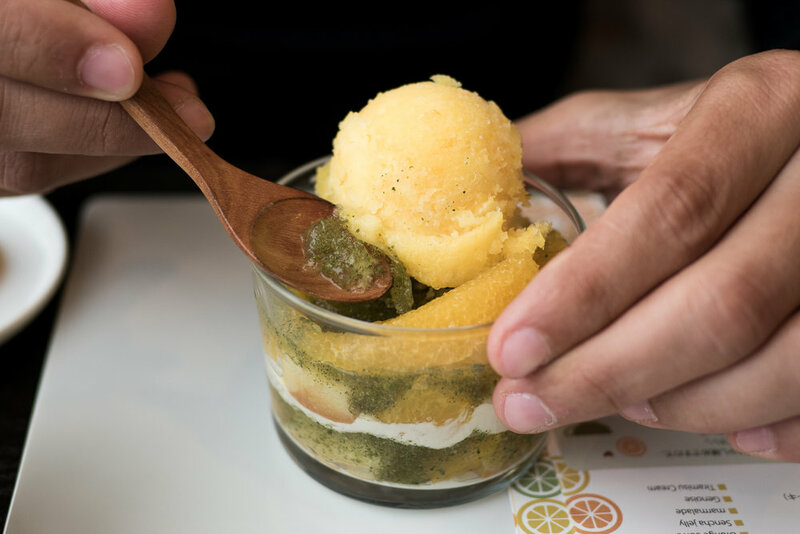 In addition to the usual favourites including genmaicha, kabusecha, sencha, hojicha and matcha, the menu presents seasonal specialties including tea sodas, lattes and ice-dishes. Our visit was during the cooler weather, so we were glad to help ourselves to the range of treats including daifuku, a small mochi enveloping red bean paste, as well as karinto, a semi-sweet and savoury toasted snack. There is more of an emphasis on well-prepared takeaway tea rather than table service, which is wonderful for a casual stopover. Before you go, be sure to check out the main counter, which offers a variety of pouches of loose leaf tea for you to take home. A standout venue to visit for its wide range of teas to sample in their own right, but most importantly, for the extensive tea and food pairing options available. Although there are savoury options available, during our visit we discovered that the chocolate and dessert items are the most popular. And it is clear to see why. 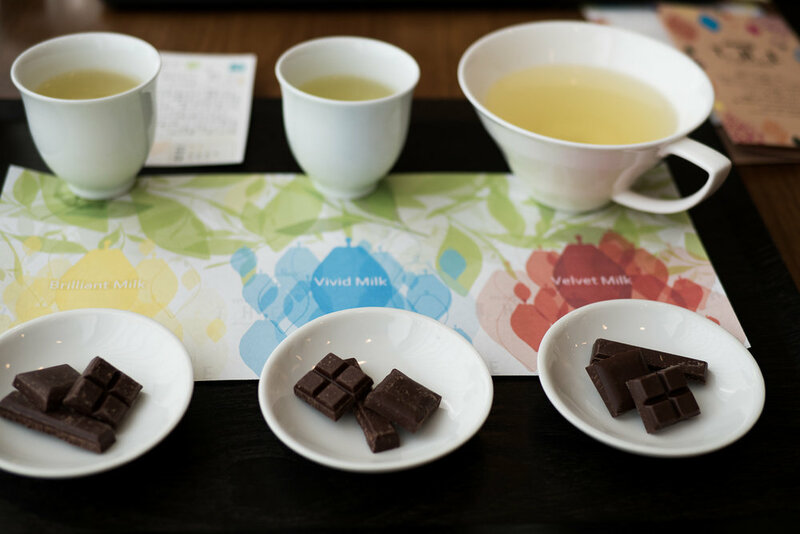 Jasmin ordered a fine sencha green tea paired with three kinds of Meiji milk chocolate, with each infusion paired to a particular quality of the chocolate. There was a lovely profile of umami and sweetness in the first and second infusions, and lastly matched with a slightly smoother, more cocoa-rich chocolate with the more astringent third infusion. My choice was a decadently creamy, jade-green matcha that arrived with a skilfully whisked, light and foamy head.The flavour was amazingly rich in umami, with lingering vegetal elements balanced against a surprisingly restrained astringency. All of this means nothing until you consider that it was paired with a dessert of sublime citrus sorbet with candied peel, sencha jelly, soaked sponge cake and a hint of whipped cream. This was a very thoughtful pairing, as the cream and sponge cake masked some of the astringency and improved the mouthfeel, the citrus complemented the tea's natural sweetness, and the sencha jelly brought out more of the delicious vegetal notes.The last thing to mention here is the lovely service of the waitstaff in guiding you through choosing a tea, or a tea and food pairing that you are likely to love. A small business card with tasting and provenance information is presented to you, alongside a small paper receptacle with tea leaves for you to dissolve on your palate, and consequently prepare you for the main serving to come. These seemingly small details truly make for a memorable experience that is certain to please.